Although the crowberry provides the third largest harvest of all berries (after blueberries and lingonberries) it is almost unknown outside the arctic regions. In the Nordic countries the use of wild berries has long traditions in home cooking as well as for therapeutic purposes. Crowberry is an evergreen shrub native to cool regions of North America, Asia, and Europe. In southern hemisphere it is found on Falkland islands. The fruits are black round berries. It is interesting to note that crowberry is fighting other species by producing a toxin. Crowberry leaves have small glands that produce batatasin III. The leaves live two to four years, and when they die and end up on the ground where they break down slowly, and continues to leak its water-soluble toxin. The toxin blocks other species to grow what makes free living space to the crowberries. Crowberry is not edible raw unless as a replacement for water. Crowberry has a taste that is slightly acidic and bitter. The berry contains tannins what makes its taste unpleasant. It is typically used cooked, seldom fresh. The berries have been used as raw material for juice, jelly, wine and sweets. Crowberries are eaten in akutaq, Eskimo's ice cream. 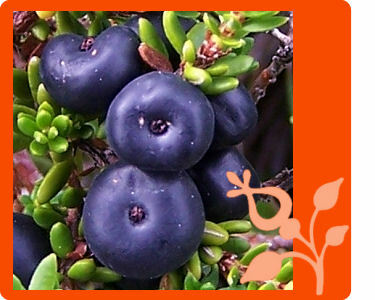 Crowberries have astringent and diuretic effect. Crowberry is a rich (460 mg / 100 g berries) source of anthocyans. (2) The increased interest in flavonoids and other phenolics as health-benefiting compounds can lead to an increased usage of the crowberries. Crowberries are a source of botanicals for preparation of cosmetic products. Ecouna of Sweden, a producer of natural cosmetics based on arctic berries and herbs, launched a new product Crowberry Night Cream. Crowberry is not an economic important crop. The crowberry anthocyans are potential source of natural colorants but largely unused. Due to the toughness of the crowberry plant, it has been used as pan scrubbers and brooms. The ability of natural dyes to color textiles has been known since ancient times. Crowberries are used as natural dyes for centuries. Old recipes from Swedish Lapland proposed several different crowberry treatments and cooking times to produce different shades of green, yellow and brown. Both the berries and the plant were used for dying the textile.